As seems to be tradition now, two straight weeks of no-question blockbusters just won't happen in the Holiday season. Whether it's studios running scared of obviously strong films, or just an inability to produce enough AAA films to fill a season, we're left with a bit of a breather this weekend, which is led by a film that I'm not sure anyone, even its stars, requested. 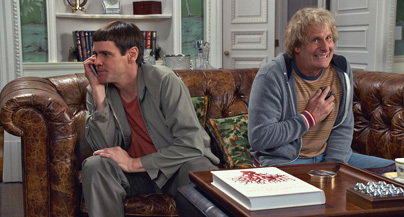 Dumb and Dumber To may represent one of the more cynical moves of 2014 in entertainment, reuniting Jim Carrey, Jeff Daniels and the Farrelly brothers for a 20-years-later sequel to the original “biggest idiots in the world” comedy. While it had its charms, it's more of a time capsule film than anything that's spawned legions of imitators. In the meantime, few of its principles have weathered the last two decades well: The Farrellys, once kings of comedy, have not had a proper hit in well over a decade – Carrey hasn't done anything of real note in about five years, and Daniels... well, Daniels has The Newsroom. This film has the pair – well, it hardly matters, does it? But okay – trying to find Daniels' daughter who was given up for adoption and who should in all likelihood never have any contact with either of these guys regardless of her parentage. The road-trip nature of the first film is repeated, including oblivious encounters with dangerous criminal elements who want to harm them. But the over-50 Carrey and the nearly *60* Daniels are showing their miles quite heavily here, and one gets the feeling that we're dealing with a retread, and one without the edge of the first film.